Congratulations to Dr. Jennie Sweet-Cushman, professor of Political Science and Cohort 6 Technology Fellow, on her invitation to speak at the 78th Annual Meeting of the Pennsylvania Political Science Association. The panel,”To Tweet or Not? Social Media and Political Science Programs”, will explore the use of social media in political science programs. Journal of Interactive Technology and Pedagogy, Again! Congratulations to Bill Biss, Assistant Professor of Interior Architecture at Chatham, on his recent publication in the Journal of Interactive Technology and Pedagogy. 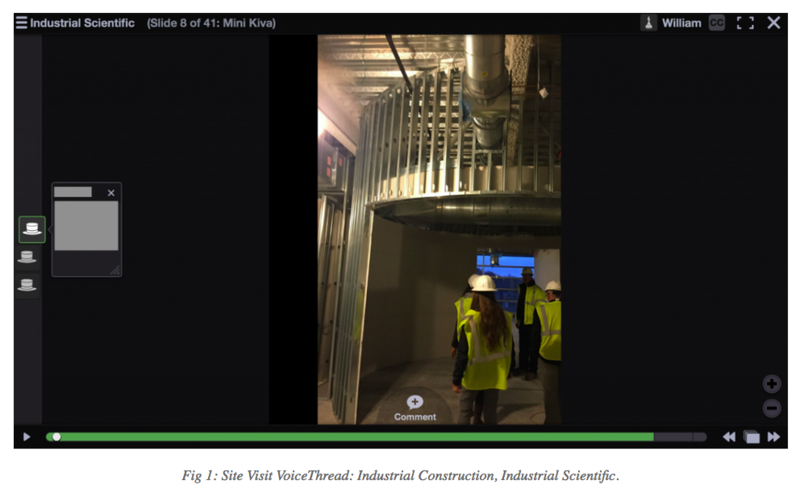 William H. Biss, Jr. VoiceThread, a media-sharing application, is used to enhance student learning by providing more flexibility for student participation. Congratulations to the 2016-2017 Cohort 7 Faculty Tech Fellows! We are eager to learn along side you! On Monday, April 18th, most of the members of the 2014-2015 Tech Fellows Cohort 5 came together to celebrate their “graduation” from the program. 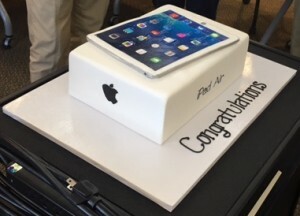 Along with many stories and laughs, one of the highlights was digging into this fabulous iPad cake by Bella Christies and Lil Z’s Sweet Boutique. Great work — we now expect great things from you! Congratulations to Dr. Jodi Schreiber on a successful 2016 AOTA Tech Day Session. 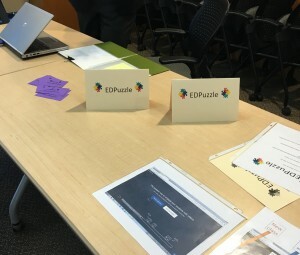 Her session, Watching Videos in Grad School: Promoting Critical Thinking Using Question-Embedded Video With the EDpuzzle App, demonstrated her work with the interactive video platform, EDPuzzle. To learn more about Jodi’s process and work, be sure to read her blog writeup. developing pedagogically sound classroom practices that increase student engagement and interaction through the use of technology. planning, implementing and assessing technology-enhanced projects for teaching and scholarship. aligning learning objectives, course activities and assessments. improving classroom management techniques for teaching with technology. evaluating technology and its effectiveness on teaching and learning. 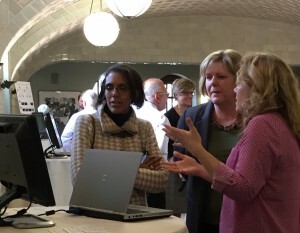 Faculty Technology Fellows participate for two years. The two-year program is designed to be iterative, project-based, collaborative, and individualized. Participants use teaching goals, course learning objectives, and personal development goals to inform their projects. Projects may start out large or small but ultimately are refined to make an impact in the classroom. Redesign at least one course by incorporating appropriately matched technologies to enhance course learning objectives. Attend a mandatory week long summer workshop (May) to learn new technologies, develop a plan for course redesign, and assessment plan. Meet monthly meetings to discuss progress. 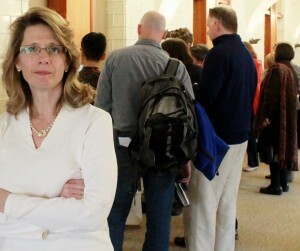 Present projects to university at the spring Faculty Professional Development Series. Serve as mentors to new faculty and faculty members within their respective departments. Attend a week-long summer workshop to refine skills and focus on redesigning another course. Attend monthly meetings with Technology Fellows peers to discuss progress. Complete an assessment of the program and provide written documentation about course redesign and outcomes. The program seeks to select a diverse group of participants across all disciplines, levels of teaching experiences, and technology expertise. All full-time faculty members are eligible to apply. A call for applications occurs each April. Number of participants is subject to funding. Cohort goal is between 8-10 participants each year. For additional questions about the program, please contact instructionalservices@chatham.edu. 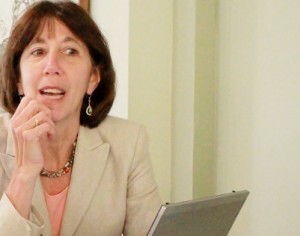 Dr. Beth Roark wanted to create a way opportunities for student-directed experiences where students could share, so she used VoiceThread, which allowed her to provide high-quality visuals with which students could interact communicating with each other and sharing ideas virtually, and improving the content and quality of their papers. 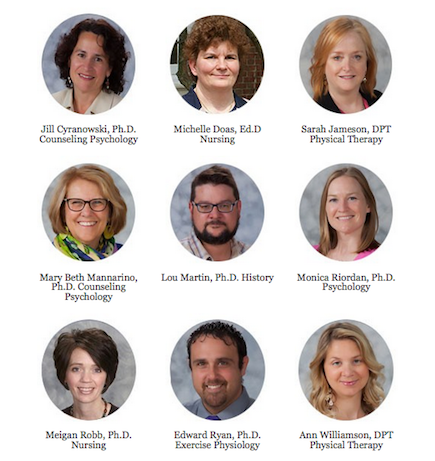 We are very proud of the Occupational Therapy faculty for having an article published in the June 2015 addition of the Online Learning Journal (OLC). Their article, Design of an Online Curriculum Promoting Transformative Learning in Post Professional Doctoral Students, explores written reflections for themes which reflected transformative learning and characteristics of curricular design which promoted transformative learning. Four of the six authors are current or past Faculty Technology Fellows. Congratulations once again on being such great leaders! Dr. Joyce Salls, one of our 2013-2014 Faculty Technology Fellows, recently presented her work at the American Occupational Therapy Association’s (AOTA) annual conference. The session,”Using VoiceThread To Enhance Student Learning”, discussed how educators are challenged to provide students with learning activities that promote reflective thinking via web technology. She demonstrated how VoiceThread, a free web based technology tool, was used to enhance student engagement both in online and on the ground courses. 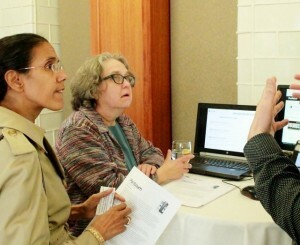 She has over 100 interested participants stop by to talk with her about the successes of her work. Congratulations to Joyce!! Another Tech Fellow JITP Publication! I’m very pleased to share that Dr. Tracy Bartel, a 2012-2013 Faculty Technology Fellow, has recently had her work published in the online peer-reviewed Journal of Interactive Technology & Pedagogy. The article, Inspiring Student Engagement with Technology, addresses the question of how to replicate the educational benefits of in-class discussions and lectures in an online environment. 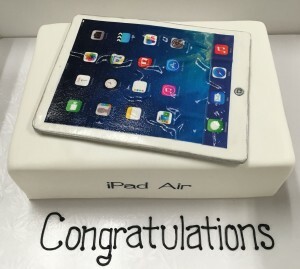 Congratulations to Tracy and thanks to her and the technology fellows for their ongoing work! P.S. Don’t forgot to come support the 14-15 Technology Fellows on Thursday, April 9th for their Faculty Lecture Series Presentation! We are pleased that Chatham has been represented in a new peer-reviewed journal, The Journal of Interactive Technology and Pedagogy (JITP). The article entitled “Incorporating the Virtual into the Physical Classroom: Online Mastery Quizzes as a Blended Assessment Strategy” originated from Kyle Beidler’s work in the Faculty Technology Fellows program. 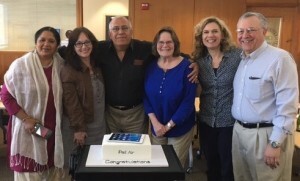 Congratulations to him and the rest of the fellows for their ongoing work!